The mobile AR platform war was kicked off at F8 by Mark Zuckerberg’s “We’re making the camera the first augmented reality platform.” That simple sentence transformed what had been a one-hit wonder in Pokémon Go into an epic battle between Facebook, Apple, Google, Tencent, Snap, Alibaba, Baidu, Samsung, Huawei and more. Now Apple’s launch of its ARkit for iOS as “the largest AR platform in the world” has taken the mobile AR war to the next level. They’re fighting over a market that could hit over a billion users and $60 billion revenue globally by 2021 (as detailed in Digi-Capital’s new Mobile Augmented Reality Report). While folks were distracted by the prospect of an iPhone AR being launched by Apple, Facebook changed the game fundamentally by launching its mobile AR Platform. But Apple secretly had its own mobile AR software plans brewing ahead and countered with ARkit for iOS. 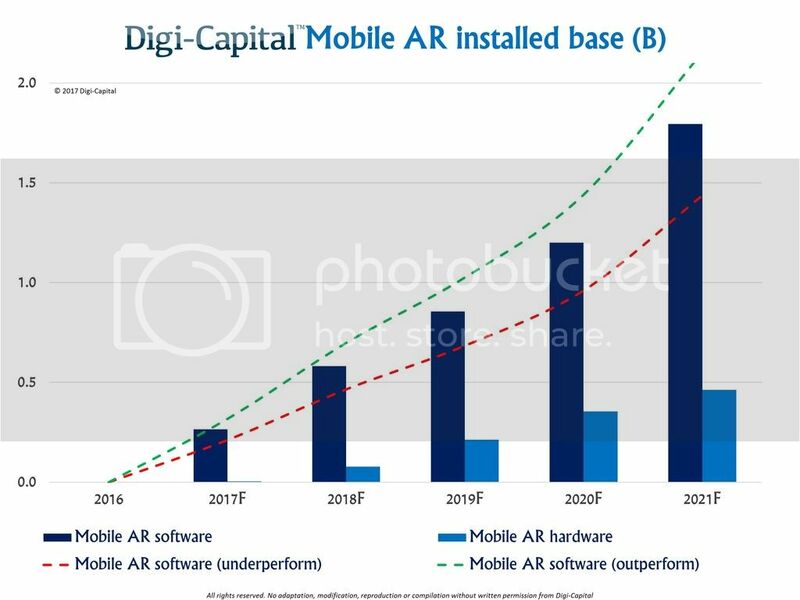 So where mobile AR hardware from Apple, Samsung, Huawei and others could deliver an installed base over 400 million users by 2021, Facebook, Apple, Tencent, Snap and others could drive a mobile AR software user base in the hundreds of millions next year, and billions by 2021. Mobile AR software platforms could deliver over 4 times the number of users of dedicated mobile AR hardware. Some folks might be incredulous at these sorts of numbers. So let’s look at hard data on installed bases and conversion rates for the major players to get a sense of scale. Facebook’s AR platform could be rolled out to Facebook Messenger’s 1.2 billion MAU, WhatsApp’s 1.2 billion MAU, and Instagram’s 700 million MAU. While it’s tempting to add these numbers together, significant overlap means that is too aggressive (i.e. Facebook doesn’t have 3.1 billion unique MAU). It’s more conservative to think about either Messenger or WhatsApp as a starting point for the number of unique users Facebook could try to migrate to its AR Platform. And Facebook knows what it’s doing when migrating users to new features. 15% of WhatsApp users use Status 10 weeks after launch, 29% of Instagram users use Stories less than a year after launch, and 54% of Instagram users use Direct 4 years after launch. That’s a growth curve. But let’s not forget that Apple is expert when it comes to converting existing users to new software, with 86% of Apple’s nearly 700 million iPhones installing iOS 10 a year after launch. That’s a pretty compelling prospect for the rollout of ARkit. Tencent has 846 million MAU for WeChat, and migrated 61% of them to use Moments every time they open WeChat 5 years after launch. While Tencent hasn’t formally announced its AR platform yet, it battled Alibaba in the mobile AR market earlier this year. Of Snap’s 300 million MAU, they’ve migrated 45% to Stories 4 years after launch. Snap doesn’t describe Lenses as mobile AR yet, but it’s still fighting a head-to-head battle with Facebook and Apple for the soul of mobile AR. And this is before considering LINE, Kakao, Snow, Baidu and more. The platforms entering the mobile AR software market have billions of users. They’re great at migrating them to new features. If hard data is anything to go by, the only user numbers that make sense for mobile AR software platforms are big ones. We’ve been saying for the last 2 years Apple is the best placed tech company to drive AR, and an iPhone AR has been part of our mobile AR forecasts since late last year. Likewise we anticipate Samsung, Huawei and others launching their own AR enabled smartphones (whether using Google Tango or something proprietary). With phone replacement cycles at 2½ years and high-end phones anywhere between 1/3 and 2/3 of smartphone sales (depending on manufacturer and geography), range-topping AR phones could deliver an installed base of at first tens and then hundreds of millions in a few short years. Facebook’s mobile AR Platform and Apple’s ARkit for iOS may have kicked things off this year, but the inflection point for mobile AR software revenue might take time as the mobile AR developer ecosystem spins up. Similarly even if Apple, Samsung or Huawei launch new mobile AR hardware before the end of the year, mobile AR hardware’s inflection point could take a year or so to get here. 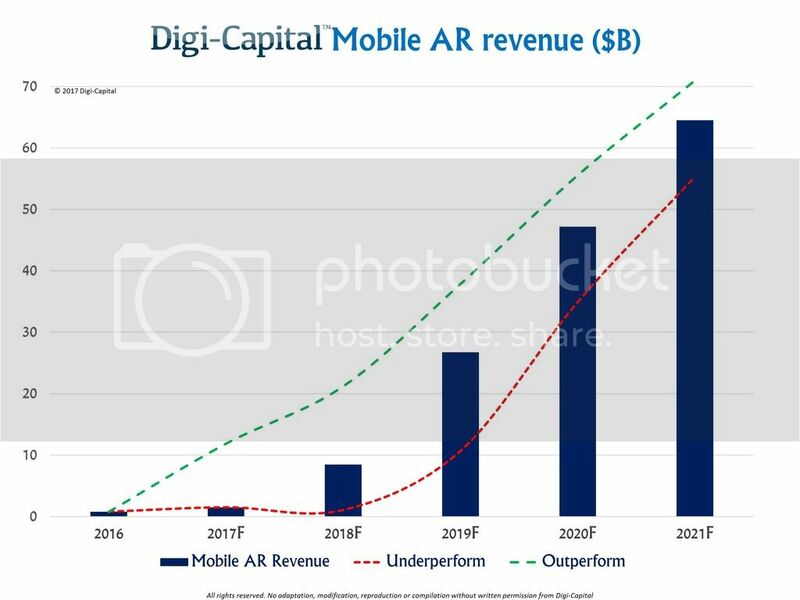 So mobile AR revenue could stay below $10 billion through 2018, with an inflection point around 2019 seeing dramatic acceleration to a market worth more than $60 billion revenue by 2021. The revenue drivers come down to installed bases, use cases and unit economics, but what that revenue might look like could be different to what folks expect. Pokémon Go was the catalyst for mobile AR last year, but the bulk of mobile AR revenue could be in sectors other than games. 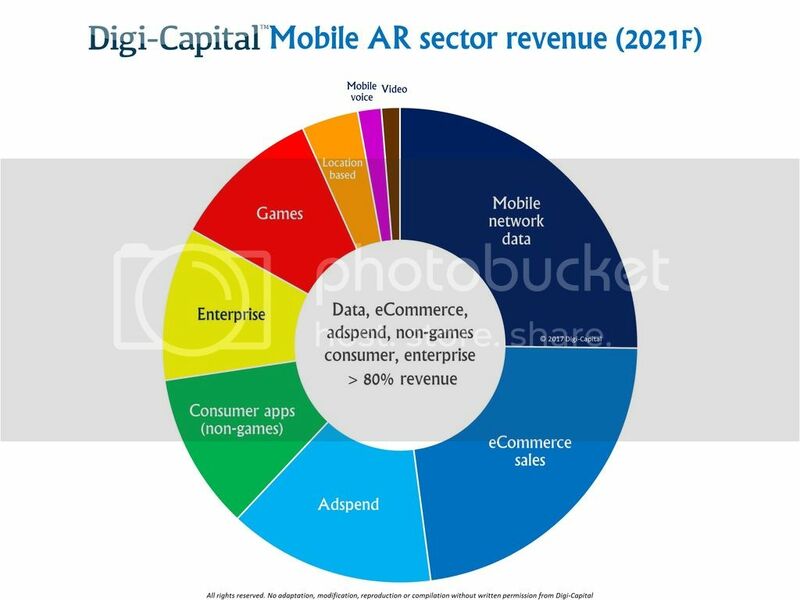 Over 80% of mobile AR revenue could come from mobile network data, eCommerce sales, advertising, consumer (non-games) apps and enterprise/B2B sales. You might have spotted that hardware isn’t listed here yet, and there’s a reason for that. Until Apple, Samsung or Huawei launch mobile AR hardware, we don’t know if their AR phones will shorten phone replacement cycles to stimulate sales, or enable premium pricing to grow revenue per unit. Until there is hard data from mobile AR hardware launches, a revenue neutral stance for hardware is the most conservative approach. Mobile AR could generate huge spikes in mobile network data usage, as developers take advantage of the new features and leverage the cloud to keep things lightweight and fast. A tsunami of data means that the telcos could take a quarter of mobile AR revenue to fill the data pipeline. What isn’t clear yet is whether this will be new money from premium pricing, or cannibalization under existing data plans. Mobile network leaders need to think long and hard about how to make mobile AR data revenue a profit driver, not a loss leader. 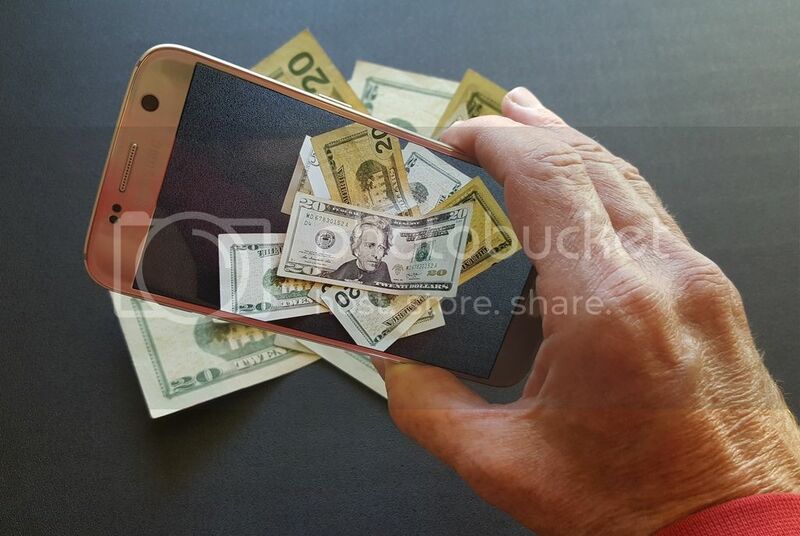 eCommerce sales (goods and services, not in-app purchases) could take more than $2 of every $10 spent on mobile AR. Alibaba, Amazon, eBay and a range of new startups will be able to sell stuff to folks in totally new ways. While some of this might cannibalize existing eCommerce, mobile AR eCommerce could take another bite out of the total retail market. Adspend looks set to take more than $1 of every $10 generated by mobile AR, with Blippar the first mobile AR advertising unicorn. New native advertising formats are emerging to leverage the medium and the location based data supporting it. Google and Baidu have great opportunities here, given their wealth of data and maps platforms. Non-games consumer apps, enterprise/B2B and games each look set to take around $1 of every $10 of mobile AR revenue. Where Pokémon Go has largely inspired copycats so far, these three sectors hold massive opportunities for incumbents and startups alike to launch totally new types of apps to take advantage of everything mobile AR has to offer. Lastly, location based (i.e. theme park), mobile network voice and video could also generate significant revenues from mobile AR, but on a smaller scale. 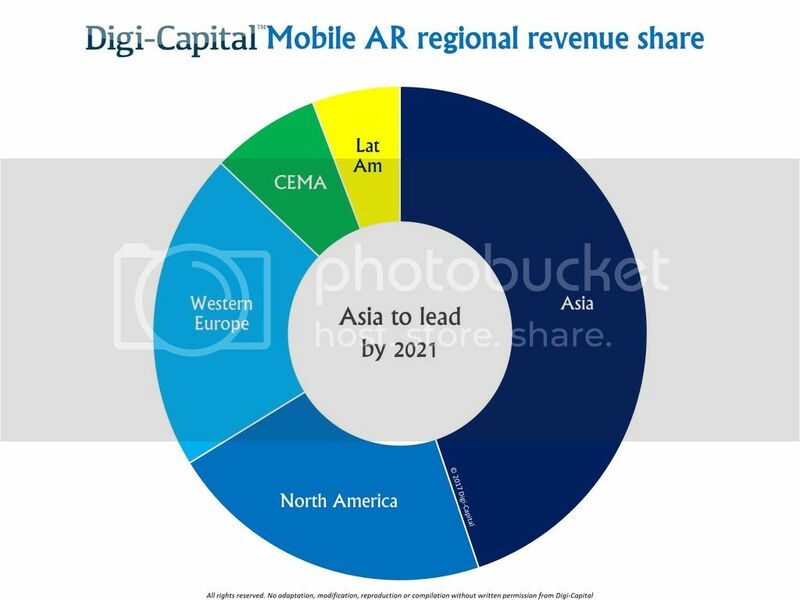 Combining our forecasts by sector and region indicates that Asia (China, Japan, South Korea, others) could take just under half of mobile AR revenues globally, with North America and Western Europe each taking about a fifth. So where modern VR kicked off in the US and migrated to Asia, mobile AR looks more balanced with major players like Tencent, Alibaba and Baidu joining Facebook and others on the global stage. Mobile AR could become the dominant AR/VR market for the foreseeable future, as it solves the 5 major consumer challenges for AR (hero device, all-day battery life, mobile connectivity, app ecosystem, telco cross-subsidization). Together with backing from major global consumer platforms like Facebook, the inflection point for AR/VR might now be within sight. Mark Zuckerberg is right, but it isn’t just the camera. The phone is the first (software) and second (hardware) augmented reality platform. And that’s a one-two punch you either get to throw or get knocked out by.